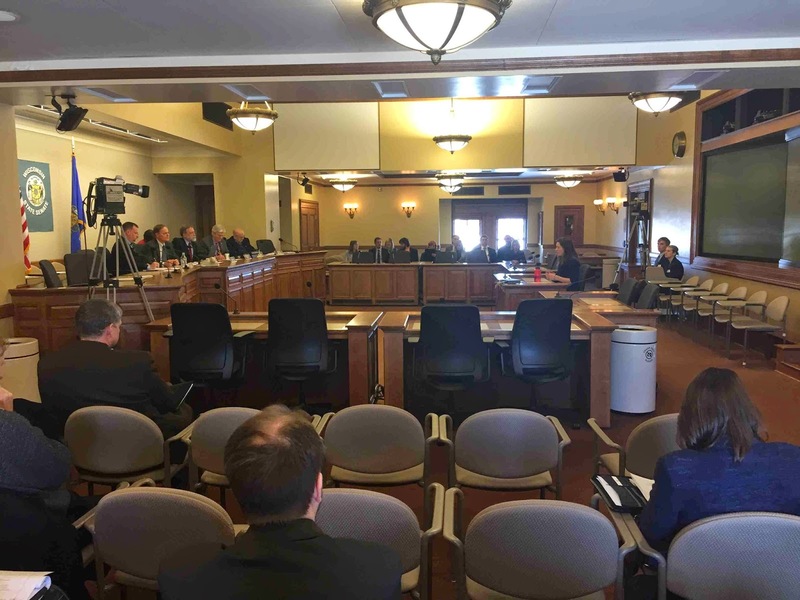 Yesterday, our executive director, Tyler Huebner, testified before the Wisconsin Senate's Natural Resources and Energy Committee in an informational hearing on the Focus on Energy program which delivers energy efficiency and renewable energy rebates and information to individuals, businesses, farmers, and local governments throughout Wisconsin. The Committee was interested in learning about the progress and current operation of the program. company based in Chilton, testifying before the committee. In addition to our own testimony, RENEW invited business members DVO, Inc of Chilton, Eland Electric of Green Bay, and BIOFerm of Madison to testify about the benefits of Focus on Energy to their businesses and to the customers they serve. RENEW and our members testified that the Focus program for renewable energy is a key market driver to get customers to invest in renewable energy projects. We discussed the job creation elements of the program, how the Focus program leverages 5-10 times the amount of private funds to get projects done, and the businesses discussed powerful stories from their customers' projects and their own business growth. The hearing went very well. Testimony also came from representatives of the Focus on Energy program, Cadmus, who conducts the evaluations of the program, Customers First! Coalition, Wisconsin Utilities Association, Clean Wisconsin, Johnson Controls, CREE Lighting, and others. RENEW's testimony is printed below. My name is Tyler Huebner, and I am the executive director of RENEW Wisconsin, a nonprofit organization which promotes renewable energy and represents Members including individuals and over 50 businesses in Wisconsin’s renewable energy industry. Renewable energy technologies have been offered in Focus on Energy since 2002. Installing these types of energy systems enable businesses, farmers, local governments, schools, and individuals to become more self-reliant for the energy needs, become more energy independent, save money, and plan their energy costs for the future. Funding for renewable energy rebates has averaged $5 to $6 million per year to customers, over the years from 2007 to 2014. The Focus on Energy rebates are an important stimulus to get customers interested in the program, and get them to act and invest their own funds into projects. The renewable energy program leverages significant levels of private funds. In 2012, for example, $5 million in incentives from Focus on Energy leveraged over $40 million in additional funds. Overall, the Focus program, per a 2012 evaluation of economic impacts, supports over 1,400 jobs per year in Wisconsin, with more jobs created in future years too due to the savings. The renewable energy portion actually accounted for more jobs per dollar than the energy efficiency funds. Focus on Energy, because it is funding just a portion of overall project costs, provides a large jobs multiplier for the amount of funding spent. The rebate structure of the Focus program has led to its success in the marketplace over the past 12 years. Using incentives has proven most successful way to obtain the participation in the program. The renewables rebates were renewed for 2015 and 2016, with a decision from the Public Service Commission in 2016 which will determine if rebates will be available in 2017 and 2018. Going forward, we look forward to also making the new $10 million renewable energy revolving loan program a success, too. This loan program is modeled after a successful program run in Iowa. From our early conversations with our Member businesses, it may work much better for some technologies like solar, than others, particularly digesters, given their larger investment needs. If the loan program is successful, it will help banks get more comfortable with lending for renewable energy technologies through the education and technical assistance the Focus on Energy team will provide. The new $6.4 million dairy digester program is also promising, as it will explore how to make the digester technology work on smaller farms. With approximately 12,000 small to medium sized dairy farms, identifying workable technologies and projects may be able to open up this new market for digesters. The renewable energy program has gotten consistently more cost-effective over the years. The most recent evaluations show renewable energy provides a 2-to-1 overall effectiveness when economic benefits including job creation are included, and is now just shy of 1.0 on energy-only cost-effectiveness. Solar PV, for the first time ever, had a cost-effectiveness above 1.0 in 2013. In closing, the renewable energy program is program that creates jobs, that drives investment into Wisconsin’s economy, and that enables businesses, farms, local governments, and individuals to become more energy independent and more in control of their future energy costs.